PLEASE READ THESE TERMS AND CONDITIONS (INCLUDING OUR DATA PROTECTION POLICY https://www.singhealth.com.sg/pdpa) CAREFULLY BEFORE USING THIS WEBSITE AND/OR THE SERVICES OR FUNCTIONS OF THE WEBSITE SO THAT YOU ARE AWARE OF YOUR LEGAL RIGHTS AND OBLIGATIONS WITH RESPECT TO SINGAPORE HEALTH SERVICES PTE LTD AND/OR ITS RELATED CORPORATIONS (INDIVIDUALLY AND COLLECTIVELY, “SINGHEALTH”, “WE”, “US”, AS THE CASE MAY BE). These Terms and Conditions (together with the documents referred to in it which are hereby incorporated by reference) (collectively, “Website T&Cs”) informs you of the terms on which you may use our website (“Website”), whether as a guest or a registered user. Use of the Website includes accessing, browsing, or registering to use the Website and the functions and services offered on or made available through the Website (collectively “Website Functions”). By accessing and using the Website and/or the Website Functions, you hereby agree to be legally bound by these Website T&Cs and you agree to comply with them. If you do not agree to these Website T&Cs, please leave the Website and cease use of the Website and/or the Website Functions immediately. We reserve the right to change, modify, suspend or discontinue the whole or any portion of the Website Functions or the Website at any time. We may also impose limits on Website Functions or restrict your access to parts of or the entire Website Functions, or the Website without notice or liability. We may from time to time modify, vary or amend these Website T&Cs at any time by posting the amended Website T&Cs at this Website. Such modification shall be effective immediately upon posting on the Website. Any use of the Website Functions or the Website after the amendment of these Website T&Cs shall be deemed to be acceptance of the amended Website T&Cs by you. If you do not agree to the amended Website T&Cs, you have the right to close your account with us and/or cease your use of the Website Functions. 1.1 These Website T&Cs govern your use of our Website and the Website Functions which are made available through the Website. You are at least 18 years old and have the necessary legal capacity, right, power or authority to agree to these Website T&Cs. 2.1 We may offer various Website Functions through the Website, including without limitation, access to platforms such as the HealthXchange platform (“HealthXchange”). 2.2 You acknowledge and agree that to access and use certain Website Functions and platforms such as HealthXchange, you may be required to open an account and register as a member of the Website. In addition, you shall be required to comply with additional terms and conditions including the HealthXchange Terms and Conditions and such other terms and conditions, guidelines and rules which we will notify you of from time to time. 2.3 To the extent that there are any inconsistencies or conflict between these Website T&Cs and the terms and conditions governing any of our other websites, online service offerings or online platforms, the terms and conditions of our other websites, online service offerings or online platforms will prevail. 3.1 The intellectual property rights in and to the Website, Website Functions and all the content of the Website, including the designs, text, information, news, listings, graphics, images, videos, logos and button icons, editorial content, notices, applications, software (including HTML-based computer programs), music, sound and other files and their selection and arrangement (“Content”) are either owned by us or are licensed to us. 3.2 The trademarks, logos and service marks ("Marks") displayed on the Website are the property of SINGHEALTH or other third parties, and all rights to the Marks are expressly reserved by SINGHEALTH or relevant third parties. You are not permitted to use any Marks without the prior written consent of SINGHEALTH or such third party. 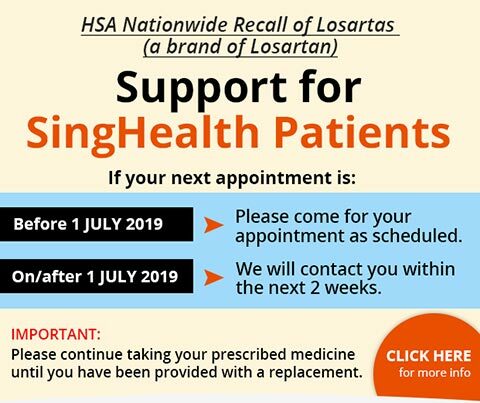 The name of SINGHEALTH or any other Marks may not be used in any way, including in any advertising or publicity, or as a hyperlink without the prior written permission of SINGHEALTH. 3.3 The domain name on which the Website is hosted on is the sole property of SINGHEALTH and you may not use or otherwise adopt a similar name for your own use. any other content submitted, distributed or otherwise reproduced by any person accessing or using the Website or the Website Functions (“Third Party Content”) except with the prior written consent of SINGHEALTH and the owner of such Third Party Content. 4.2 Without prejudice to the generality of the foregoing, you agree not to reproduce, display or otherwise provide access to the Website and/or the Website Functions, Content or Third Party Content on another website or server, for example through linking, framing, mirroring or any other technological means whether available now or in the future unless the prior written consent of SINGHEALTH is obtained. 4.3 You may, provided you have kept all copyright and other proprietary notices intact, download or print one copy of the information available on the Website for your personal, internal and non-commercial use only. Permission to reprint or electronically reproduce any part of the Website, Website Functions, Content or Third Party Content whether in whole or in part for any other purpose is expressly prohibited without SINGHEALTH’ prior written consent, and the written consent of the owners of Third Party Content. 4.4 You may not decompile, reverse engineer or otherwise attempt to discover the source code of any SINGHEALTH Content available on the Website or provided through a Website Function except under the specific circumstances expressly permitted by law or SINGHEALTH in writing. 4.5 Without prejudice to the rights and remedies which are available to us at law, we reserve the right to terminate the privileges of any member or user who repeatedly breaches paragraphs 3 and 4. 5.1 The Website and Website Functions are made available for your personal, non-commercial use only. Businesses, organizations or other legal entities may not use the Website or Website Functions for any purpose. 5.3 You understand and agree that SINGHEALTH may review and edit or delete (but has no obligation to do so) any content, messages, photos or profiles that in the sole judgment of SINGHEALTH violates these Website T&Cs or which may be offensive, illegal or violate the rights, harm, or threaten the safety of any Website users. removing any copyright, trademark or other proprietary rights notices contained in or on the Website or the Website Functions. 5.5 SINGHEALTH has the right (but is not obliged) to investigate and take appropriate action in its sole discretion against any person who posts such content on the Website or partakes in any such activities including without limitation, removing the offending content from the Website and/or terminating the account of any users which breach these Website T&Cs. 5.6 SINGHEALTH has the right (but is not obliged) to, remove or disable access to any materials (including content submitted by Website users / members and Third Party Content) that we determine in our sole discretion to be unlawful, fraudulent, threatening, libelous, defamatory, obscene or otherwise objectionable, or infringes or violates any party's intellectual property, other proprietary rights, these Website T&Cs or for any other reason whatsoever. Any such editing or removal of any such content shall be without prejudice to our other rights and remedies available at law. 5.7 You acknowledge and agree that we cannot be responsible or liable for any content submitted onto the Website by any Website users / members or any Third Party Content, and you agree to exercise access and use such only at your own risk and with care and discretion. 6.1 If you choose, or you are provided with, a user name, code, password or any other piece of information as part of our security procedures, you must treat such information as confidential and you must not disclose it to any third party. You also agree that you will be the only authorized user of the Website and/or the Website Functions using your user name and password. You agree not to provide or make known your user name and password to any other person for any purpose, including to facilitate that person's access and unauthorized use of the Website and/or the Website Functions. 6.2 We have the right to disable any user identification code or password whether chosen by you or allocated by us, at any time, if in our reasonable opinion you have failed to comply with any of these Website T&Cs. 6.3 If you know or suspect that anyone other than you knows your user identification code or password, you must promptly notify us at marcom@singhealth.com.sg. 7.1 Please note that the Content and any Third Party Content available via the Website and/or the Website Functions are for general informational purposes only and are not intended to be, and should not be treated as, substitutes for professional medical advice, diagnosis or treatment. The Content and Third Party Content are provided on the understanding that no surgical or medical advice or recommendation is being rendered to you via either the Website and/or the Website Functions. Medical treatment has to be individualised and can only be rendered after adequate assessment of your condition through appropriate clinical examination. Please do not disregard the professional medical advice of your physician or local healthcare provider or delay in seeking medical advice from them because of any information provided on the Website or via the Website Functions. For the reasons given above, you should not rely on the information provided on the Website or via the Website Functions and, to the fullest extent permitted by law, we do not accept any responsibility if you do. 7.2 You further acknowledge that the Website and Website Functions are not intended or suitable for use in situations or environments where the failure or time delays of, or errors or inaccuracies in, the content, data or information provided by the Website or the Website Functions could lead to death, personal injury, or otherwise result in significant financial loss or business interruption. 7.3 Any Content and Third Party Content posted, distributed or otherwise made available on the Website or through the Website Functions are not moderated by us. We are not responsible as author, editor or publisher of any Content or Third Party Content, whether designated as “experts” or “content partners” or similar designations and you acknowledge and agree that any use by you of any Content or Third Party Content is entirely at your own risk. 7.5 SINGHEALTH does not verify and is not in a position to verify any party’s rights to submit any content on or through the Website or Website Functions, and SINGHEALTH takes no responsibility and assumes no liability, whether direct or indirect or any incidental, special, indirect or consequential damages whatsoever, including, without limitation, damages for loss of profits or any other commercial damages or losses, for any content posted by you or any third party, or for your use of the same. SINGHEALTH and its vendors believe their data and text services to be reliable but accuracy is not warranted or guaranteed. 7.6 You acknowledge and agree that SINGHEALTH does not endorse or recommend, is not an agent, reseller or distributor of, and has no control over any of the products or services which may be offered or made available by any third party on or through the Website or the Website Functions, and SINGHEALTH hereby expressly disclaims all liabilities and responsibilities arising in relation to any such products or services whether available or advertised via the Website or on a third party website. 7.7 Any company names, products, services and branding cited or used on the Website or the Website Functions may be trademarks or registered trade marks of their respective owners and the owners retain all legal rights. The use of trade marks or service marks of another is not a representation that the other is affiliated with, sponsors, is sponsored by, endorses, or is endorsed by SINGHEALTH. 7.8 You hereby acknowledge and agree that the Website and Website Functions may use transmissions over the Internet which are never completely private or secure and that any information transmitted to the Website may not be confidential and acknowledge that you have no expectation of privacy with respect to such information, subject always to the Website’s Data Protection Policy. and in any such event, SINGHEALTH shall not be liable for any loss, liability or damage which may be incurred as a result. DISCLAIMER: THIS SITE AND THE INFORMATION IT CONTAINS IS MADE AVAILABLE ON AN "AS IS AS AVAILABLE" BASIS WITHOUT WARRANTY OF ANY KIND, EITHER EXPRESS OR IMPLIED. we are not liable for any delay or failure of the Website or the Website Functions to perform. There is no guarantee that you will be able to access the Website whenever and wherever desired. There may be extended periods of time when you cannot access the Website for various reasons, many beyond our control. 8.2 You expressly acknowledge and agree that, to the maximum extent permitted by applicable law, use of the Website and any Website Functions and performed by or accessed through the Website is at your sole risk and that the entire risk as to satisfactory quality, performance, accuracy and effort is with you. 8.3 Further, nothing in this Website T&Cs constitutes any representation or warranty by us as to your rights (if any) to use any content submitted by any third parties, including Third Party Content, all of which representations and warranties are expressly disclaimed. 9.1 You agree to indemnify, defend and hold harmless SINGHEALTH, its officers, directors, employees and agents from and against all claims, demands, losses, expenses, damages, costs and liability, including reasonable attorneys' fees, arising out of or in connection with any breach of these Website T&Cs, any breach of any applicable law by you, your breach of any third party’s rights, your use of the Website or the Website Functions or any activity related to your use of the Website (including but not limited to infringement of third parties' worldwide intellectual property rights or negligent or wrongful conduct) or any other person accessing the Website using your user name and password. 9.2 This clause shall survive the termination or expiration of these Website T&Cs (howsoever caused). SINGHEALTH, our officers, directors, employees and agents shall not be liable for any claim, damage or loss of any kind of any nature whatsoever caused and howsoever arising as a result (whether direct or indirect) of or otherwise in connection with your use of or reliance on the Website or Website Functions, including but not limited to any claim, damage or loss suffered (whether incidental, special, indirect or consequential) as a result of or in connection with any reliance on any Content or Third Party Content or other content or any other information made available or accessed on or through the Website or contained in or available from the Website or your use or reliance on any products or services on, available or accessed via the Website and / or the Website Functions or any infringement of any rights arising in connection therewith, including without limitation any loss of data, profits, goodwill, anticipated savings, reputation, business or business opportunity, regardless of the cause thereof and even if we have been advised of the possibility thereof. 11.1 We reserve the right to terminate or suspend your use of the Website without prior notice to you, at any time and for any or no reason including inappropriate behaviour on the Website. Without limiting the foregoing, if you breach these Website T&Cs or conduct yourself in a manner that we deem to be detrimental to the integrity, security and operation of the Website, the Website Functions or any information systems connected or in operation with the same, we reserve the right to suspend or permanently terminate your access to the Website and the Website Functions for any reason in our sole and absolute discretion. 11.2 You agree and acknowledge that any suspension or termination of your access to the Website may be effected without prior notice, and agree that the Website may immediately deactivate. Further, you agree and acknowledge that to the maximum extent permitted under applicable law, we shall not be liable for the discontinuation or termination of your access to the Website. 12.1 Our collection, use and disclosure of your Personal Data is governed by our Data Protection Policy, the terms of which are also incorporated into these Website T&Cs by reference and apply your use of our Website. 12.2 It is a continuing condition of your use of the Website that you agree to the terms of our Data Protection Policy as amended from time to time. 13.1 By providing your email address or registering as a member of the Website, you acknowledge and agree to SINGHEALTH sending you emails relating to your account. 13.2 You can unsubscribe to e-mails at any time by clicking on the unsubscribe link in any of our email communications. 14.1 While SINGHEALTH welcomes links to our Website from other websites, we, in no way, operate, control or endorse linking sites and reserve the right to disallow any such link at any time in our sole discretion. 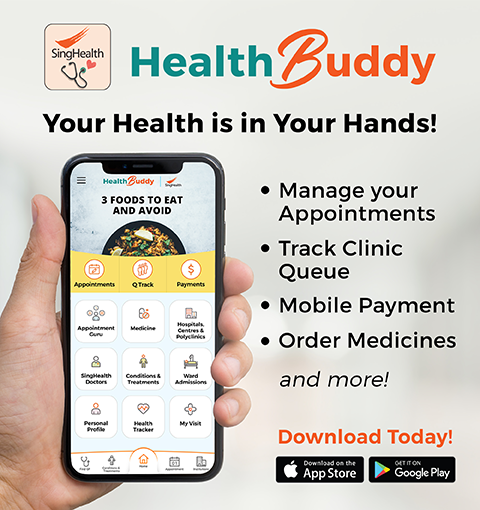 Should you wish to link to our Website, you must link to our home page at https://www.singhealth.com.sg/, and even then only with our written consent. 15.1 We may provide links to third party sites. We have no control over such third party sites, and you acknowledge and agree that we are not responsible for the availability of such external sites or resources, and do not endorse and are not responsible or liable for any content, advertising, products, services or materials on or available through such sites or resources, including Third Party Content. You further acknowledge and agree that we shall not be responsible or liable, directly or indirectly, for any damage or loss caused by or in connection with use of or reliance on any content, goods or services on or available through any such site or resource. 15.2 You further acknowledge that your access to and/or use of third party sites is entirely at your own risk, and that third party sites usually have their own terms and conditions, including privacy policies, over which we have no control and which will govern your rights and obligations with respect to the use of those sites and resources. 15.3 We do not warrant that the third party sites will meet your requirements or that the same will not cause you any loss of any kind, and you agree that to the maximum extent permitted by law, SINGHEALTH shall not be liable for any loss or damage of any kind incurred in connection with your use or reliance on any content, information or other materials on or available through such third parties. 16.1 You may not transfer any rights or obligations you may have under these Website T&Cs. We reserve the right to transfer or to subcontract any right or obligation under these T&Cs at our sole discretion without your consent. 16.2 If any term or provision of these Website T&Cs is found by a court of competent jurisdiction to be illegal, invalid or otherwise unenforceable, such term or provision shall not affect these Website T&Cs’ other terms or provisions, or the whole of these Website T&Cs, but such term or provision shall be deemed modified to the extent deemed necessary to render such term or provision enforceable, and the rights and obligations of the parties shall be construed and enforced accordingly, preserving to the fullest permissible extent the intent of the parties and these Website T&Cs’ purposes. 16.3 Nothing in these Website T&Cs shall constitute or be deemed to constitute an agency, partnership or joint venture between SINGHEALTH and you and neither party shall have any authority to bind the other in any way. 16.4 A person who is not a party to these Website T&Cs has no right to enforce or enjoy the benefit of any term of these Website T&Cs under the Contracts (Rights of Third Parties) Act (Chapter 53B). 17.1 These Website T&Cs shall be governed and construed in accordance with the laws of Singapore. 18.1 By accessing this Website, you agree that final and binding arbitration shall be the sole and exclusive forum and remedy for any and all disputes and claims relating in any way to or arising out of these Website T&Cs, the Website (including your visit to or use of the Website) or the Website Functions, except to the extent that either you or SINGHEALTH have in any manner infringed upon or violated or threatened to infringe upon or violate the other party's patent, copyright, trademark or trade secret rights, then the parties acknowledge that arbitration is not an adequate remedy at law and that injunctive or other appropriate relief may be sought. 18.2 The reference to arbitration in these Website T&Cs shall be a submission to arbitration within the meaning of the Arbitration Act (Cap. 10) for the time being in force in Singapore. Such arbitration shall be conducted in the English language in accordance with the Arbitration Rules of the Singapore International Arbitration Centre (“SIAC Rules”) for the time being in force, which rules are deemed to be incorporated by reference into this Clause, except in so far as such Rules conflict with the express provisions of this Clause, in which event the provisions of this Clause will prevail. 18.3 The seat of the arbitration shall be Singapore. The arbitral tribunal shall consist of one (1) arbitrator to be appointed by mutual agreement between you and SINGHEALTH. Any party may propose to the other(s) the name or names of one (1) or more persons, one (1) of whom would serve as the arbitrator. If no agreement is reached within thirty (30) days after receipt by one (1) party of such a proposal from the other, the arbitrator shall be appointed by the President of SIAC. The arbitrator must not be a present or former employee or agent of, or consultant or counsel to, any party or any related corporation as defined in Section 6 of the Companies Act (Cap 50) of any party. 18.4 Any decision or award of an arbitral tribunal appointed pursuant to this Clause will be final and binding on both you and SINGHEALTH and the execution thereof may be entered into any court having jurisdiction. 18.5 You undertake to keep the arbitration proceedings and all information, pleadings, documents, evidence and all matters relating there to confidential.